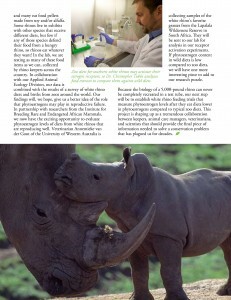 Zoo diets for southern white rhinos may activate their estrogen receptors, so Dr. Christopher Tubbs at the San Diego Zoo Institute for Conservation Research analyzes food extracts to compare them against wild diets. Researcher Annemieke van der Goot collects samples of spear grass from wild rhinos in a nature reserve in South Africa.These samples will be sent back to the Institute’s Reproductive Physiology lab at San Diego Zoo to be analyzed for phytoestrogen content. 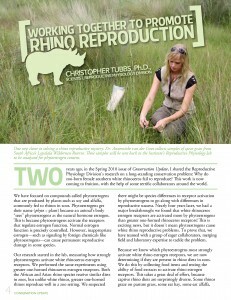 The full article in San Diego Zoo’s Conservation update Spring 2012 can be downloaded by clicking here.